One of the few trails open during spring time on Mount Hood, as snow still covers the majority of the park, is a beautiful tree-covered trail that leads to a tremendous waterfall. But this hike would be enjoyable anytime during Spring to Fall. On a warm day you may be tempted to swim in the falls and the stream flowing down the mountain, guiding the trail. My husband and I took a day trip from Portland to visit Mount Hood. The Tamanawas Falls Trail was on my list of possible trails and was recommended to us by the women at the Information Center in Government Camp. Here’s everything you need to know about hiking this short, tranquil trail! Directions from Portland: Follow Highway 26 past Government Camp. After passing Trillium Lake trailhead, Highway 26 connects with Highway 35. Follow Hwy 35 for several minutes. Some landmarks to look out for to know that you’re getting close are: road NF-44 and Little John Sno Park and the Sherwood Campground. The total drive from Government Camp to the trailhead is about 23 minutes. The trailhead is on the left side when coming from this direction. There is a small amount of parking available. The trail begins with a bridge crossing over the East Fork of the Hood River. The East Fork Trail connects with the Tamanawas Trail. Follow the signs for the Falls to stay on the correct path whenever there is a junction. The bridge at the trailhead is the first of two river crossings. But first, the trail leads hikers up the mountain. The beginning is the steepest part of the trail, but the elevation change is minimal. After crossing Cold Spring Creek, turn left and continue another quarter of a mile. Keep left to follow the trail. From this point on the trail stays parallel with the creek, winding its way towards the falls. There are plenty of opportunities for getting into the creek, and lots of dogs took advantage of the creek’s proximity. The entire trail is well manicured, even when there are some minor obstacles like rocks, fallen trees, or pools of water from snow melt. I’d still recommend wearing sturdy shoes for this trail. Sandals, like Chacos, however would work well, especially in the summer time. As the trails gets closer to the falls, the tree coverage disappears and is replaced with a rocky path. If you can’t hear or see the falls at this point, you’ll know you’re close when you reach the mini boulder field. You may lose track of the trail once you reach the boulders, but there are markers on some of the rocks to help you find the easiest route. The path winds its way up the boulders to reconnect with the trail. The Tamanawas Falls are approximately 100 feet high and can be as wide as 40 feet. The falls are powerful. It was difficult to get close without getting drenched from the blowing mist. The rocks surrounding the falls are also very slippery, not just from mist but moss. Tread carefully. If I didn’t have my camera, I would have welcomed the watery breeze as it was warm, especially for an April day. This is another reason I recommend a pair of sandals like Chacos so you can climb the slipper rocks or wade through the creek with ease. 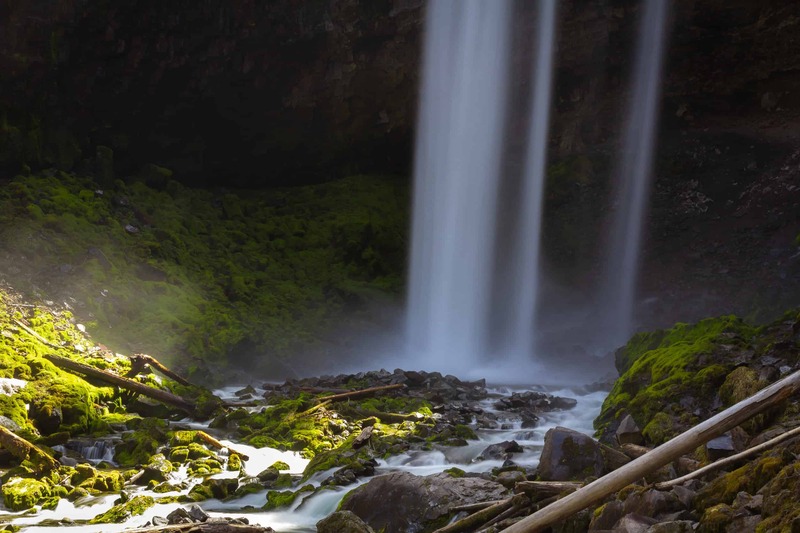 Photo Tip: Reach the falls early in the morning or after 2 pm. In April, we arrived at the Falls close to 1 pm and the sun was still above the falls. Even with my neutral density filter, it was too bright to get that silky water look in my photos. I had to wait until the sun dipped behind the trees to get the look I wanted. I wasn’t sure what the weather would be like on the mountain, especially for the trails I had in mind, some of which possibly still in snow. I over layered. Halfway through the trail I had to shed some clothes. Lesson? Its warmer than you’d expect on this trail in April, on a sunny day. My shoes weren’t the best fit either. I packed waterproof boots, good for snowshoeing and muddy trails, but not the best for climbing over rocks, slipper or dry. Hiking pants or shorts – material that breathes or can be rolled up will make you more comfortable on this hike as the trees disappear. For Photos – tripod, lens wipes, ND filter or protection filter. Your lens will get wet when shooting the falls. The tripod I use is a Joby Gorilla Pod because its light weight and fits in a carry on and can attach to anything. Bag for dirty shoes – the trail has muddy areas as the snow melts. If you want to keep your car clean, leave a bag in the car for your muddy shoes. One more thing you may need is a Day Permit/Recreation Pass: During May to October a day parking permit is required. During the winter (yes, April was still winter) a permit was not required for this trail. To determine whether you’ll need one or where to purchase your pass, click here. Or stop by the Information Center in Government Camp.